Mondango 3 is an exceptional 56m yacht with naval architecture by Dubois Naval architects, with interior by Reymond Langton Design. If you fancy a vacation with a home-from-home atmosphere, friendly crew and like-minded fellow guests, choose Mondango 3. This striking superyacht delivers everything from a very warm welcome to delicious cuisine and a fantastic cruising experience. 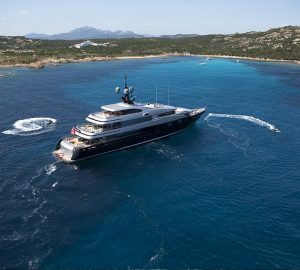 She has a stylish, comfortable interior and is one of the most sought-after luxury vessels on the charter market. 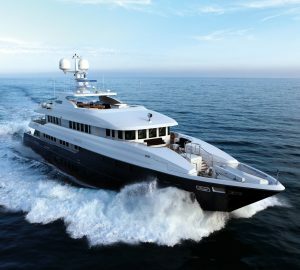 She is versatile, spacious with a large aft cockpit that has electrically operated glass panels which provide shade when the yacht is under way. 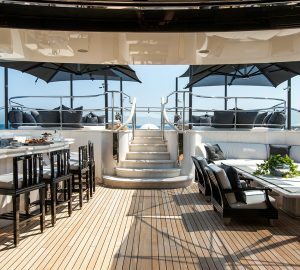 Dine al fresco on the flybridge or take a dip in the spa pool which is concealed when not in use, on the aft deck. This amazing superyacht is huge inside, light, airy and full of character. With her contrasts, detailing and unique textures, Mondango 3 will certainly be everything you expected. The main deck has a floor to ceiling carved leather wall along with glass inserts that house a 103-inch TV. This also divides the main saloon from the dining area. 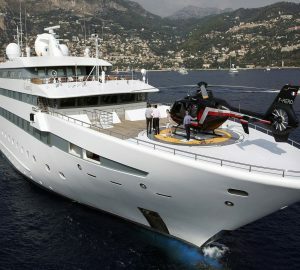 Mondango 3 is a world cruise ship that can also access anchorages and shallow harbours quite easily. Mondango 3 arrived on the market in 2014 and has travelled to some of the remotest corners of the world. 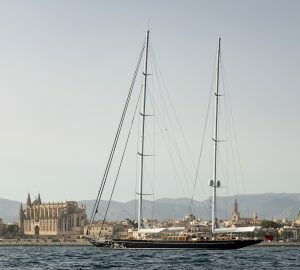 This 56m/185ft sailing yacht was designed by the British design studio of Reymond Langton and built by Alloy Yachts, New Zealand. Dubois Naval Architects were also involved in this most beautiful creation. She has a swing keel and variable draught which is just 4m in length at its shortest point. This means she can reach anchorages and harbours that most other sailing vessels the same size cannot. The swing keel can increase to 11m which gives guests a smooth, comfortable ride when out in the open waters. Southern Spars and North Sails were responsible for her sails and rig which give Mondango 3 good stability. 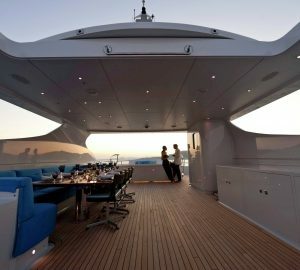 The foredeck follows the sweeping curve of the superstructure and wraparound windows. Below the aft deck there’s a whirlpool along with a retractable swim platform. This allows guests to get very close to the water, so easy access for everyone on board. On the flybridge aft of the helm, there’s lots of yellow upholstered seating and sun pads. It’s ideal for lounging in the sun and a favourite spot for everyone. A sunken aft cockpit transforms into a huge entertainment area with lovely seating and a dining table large enough to take 10 guests. Side windows and the curved aft glass panel slide down to protect diners from any wind or sea spray. This is the perfect place for charter guests when the superyacht is in a harbour to watch the comings and goings of people on shore. Open the curved glass doors into the main saloon so natural light streams in through the many windows. The bleached oak wall panels and pale wool carpets are lit up with this light offering a natural effect. Relax and sit back on one of the two pale Tutsi sofas or on a grey Fendi leather armchair with its orange and sapphire coloured cushions. Stripped ziricote side cabinets and a coffee table make up the accessories in this part of Mondango 3. A hand-carved bar top has a glass blue flower engraved into it which matches the same pattern on the coffee table. Palm wood inlays in the ceiling are etched the same as the oak wall panels in the hallway. The continuous curved aesthetic lines on board this amazing vessel embodies Chinese feng shui to create a calm, soothing atmosphere. In the main saloon is a walk-around wall which has a 106-inch television set inserted into it. The forward side has dark brown, carved leather inserts which form part of a formal dining area complete with a ziricote table. Leather-wrapped “floating” stairs can be seen in the main hallway which descend to the lower deck. Here the master suite is the same size as the widest point of the hull amidships which leaves two twin and two double cabins to complete the space aft. All state rooms have light coloured carpets and offset bleached oak walls. The furniture has dark palm inlays which is shown off by the recessed lighting. Souvenirs from the owner’s personal adventures can also be found dotted around the cabins like tribal masks from South Africa. For a touch of interest, there are vintage travel chests in the sleeping quarters too. The master suite is decorated in vivid colours like gold, sapphire and amber with a white onyx en suite. A VIP cabin takes everything to extremes in vivid blue and lime green. Cushions and brightly coloured throws add the “wow” factor and compliment the cabins perfectly. Four guest cabins have en suite bathrooms with showers in pale marble. If you would like a day in the water, ask a member of crew to bring out the water toys. Enjoy time on the 7m Smuggler Custom tender, the 5.4m Smuggler Strata or the Hobie Mirage Tandem Island sailing kayak, great fun! There are water skis, towables, wake boards, paddle boards and an island raft. Why not try your hand at fishing or snorkel among the reefs and coral? 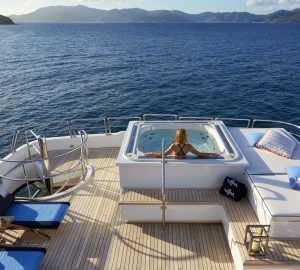 With so many water toys to choose from, state-of-the-art visual and audio systems, Wi-Fi, Satcom and cellular communications facilities, Mondango 3 is premium luxurious sailing vessel. 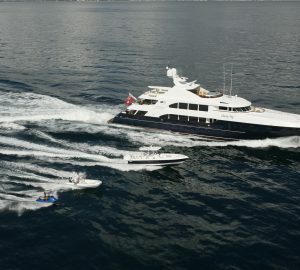 Stylish with lots of flair, she’s a wonderful choice for a yacht charter vacation.